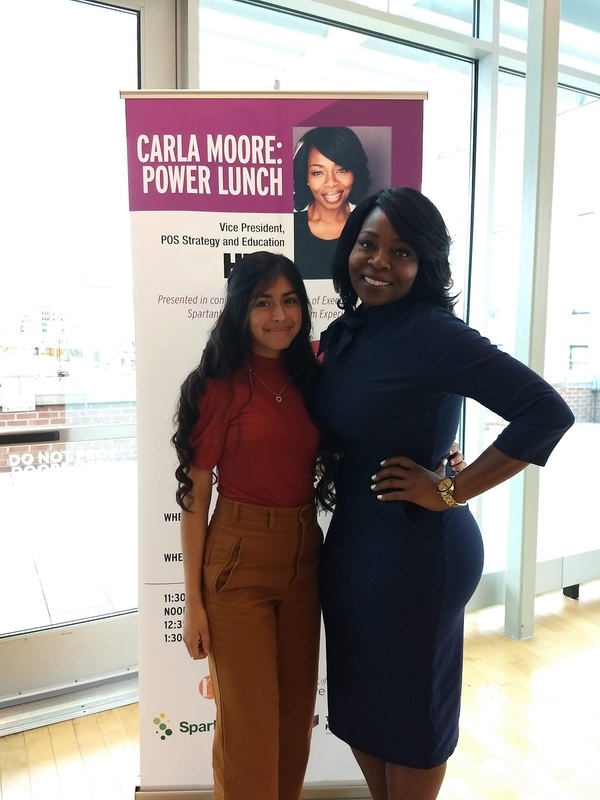 On Wednesday, November 7 SpartanNash, Network of Executive Women, and The Mosaic Film Experience hosted the Carla Moore: Power Lunch. Carla Moore, who currently serves as the Vice President of Sales Strategy and Education for Home Box Office (HBO) in New York, delivered a keynote speech about her passion- activating personal power. Years ago, Carla had landed at the Chicago airport, something she had always done having to travel frequently for work. It was a bright, sunny day and as she drove along the highway, her mind wandering, when something happened that would change the entire trajectory of her life. “15 minutes after leaving the airport, I crashed head-on into a concrete meter – at 55 miles an hour, with no seatbelt, in a convertible. I thought it was over,” said Moore. Years after the accident, Carla has accomplished all these things. Moreover, since adopting the mindset to live the way she had imagined, the trajectory of her career has been sharper. Carla Moore has been a friend of The Mosaic Film Experience for many years. She is a regular guest at the annual Mosaic Event and brings with her an empowering message to help West Michigan students succeed, live the life they imagine, and find their own personal power. Mariah Barrera, a junior at City High and the 2017 winner of the Mosaic Mobile film competition, resonated Carla’s message in her introduction of the HBO executive at the luncheon. “Mosaic made me realize that I can make things to empower and inspire other people,” Barrera said. Mariah already had the hobby of making videos on her phone, but through the opportunity that The Mosaic Film Experience offers, she has now changed that hobby into something that helps her live the life that she imagines. One where her voice is important, valid, and can be expressed creatively.